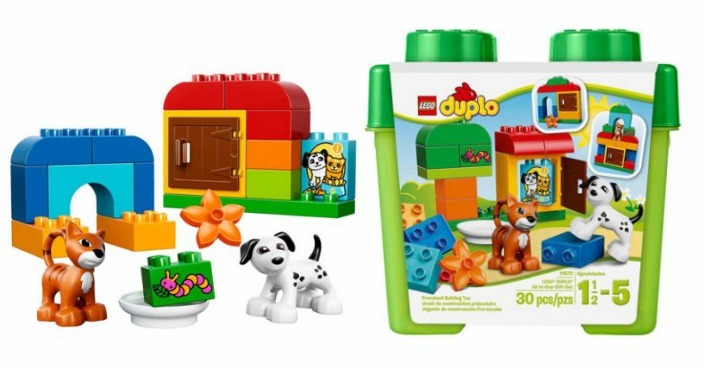 LEGO DUPLO Creative Play All-in-One Gift Set Just $18.14! FREE Shipping! You are here: Home / Great Deals / LEGO DUPLO Creative Play All-in-One Gift Set Just $18.14! FREE Shipping! Right now you can get this LEGO DUPLO Creative Play All-in-One Gift Set for just $18.14 at Walmart! The LEGO DUPLO Creative Play All-in-One Toy Gift Set gives young children an early start in imaginative thinking and constructive playing. It includes a total of 30 pieces which can be put together in various ways and which are large and designed to be held easily by small hands. These LEGO DUPLO bricks come in various sizes, shapes and colors. Kids can build a tree, a pet shelter or other structures. Also included is a box with a lid for storing the pieces when playtime is over, keeping the room tidy. This LEGO gift set is recommended for children between the ages of 1 1/2 to 5 years.